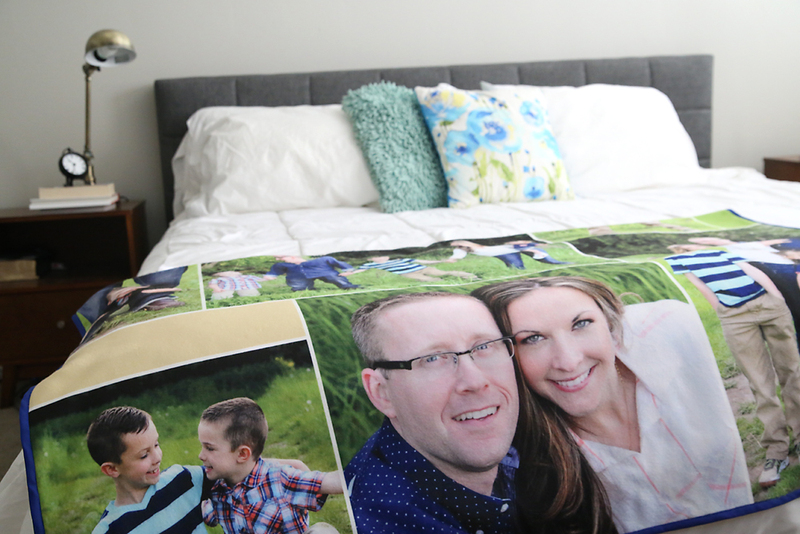 If you’re looking for an extra special handmade gift for someone this holiday season, I have a great idea for you: make a photo collage blanket. 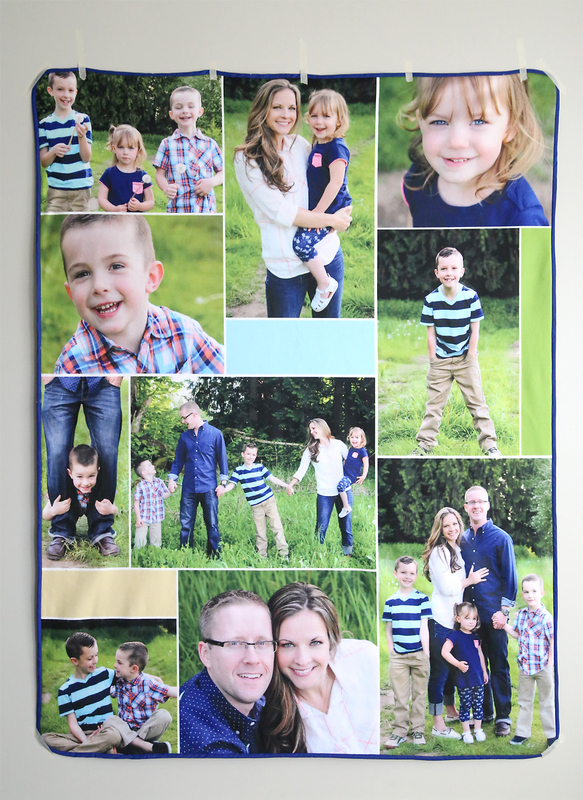 Take someone’s favorite photos, have them printed on fabric, and add a fuzzy backing for the coolest gift ever. Seriously, who wouldn’t love one of these? For today’s post, I’ve teamed up with Adobe again to bring you another project made using Photoshop Elements 15 (thank you to Adobe for sponsoring this post). Photoshop Elements 15 is absolutely my favorite way to make a photo collage. 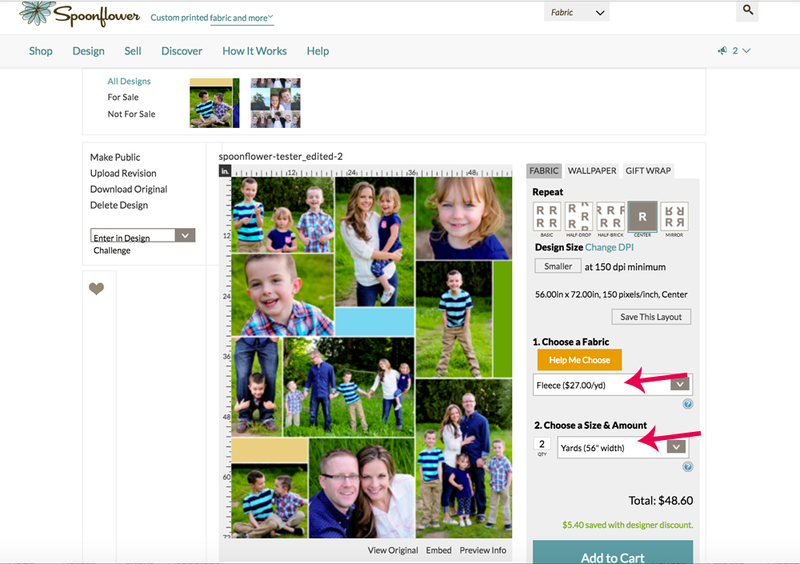 There are other software options out there that let you make collages, but those usually involve dropping your photos into pre-made templates. With Photoshop Elements you have complete control over exactly how you want your collage to look: how many photos to use, what size and shape each photo will be, the dimensions of the finished collage, and more. Since I wanted you to be able to see why I like making collages in Photoshop Elements so much, I’ve made a screencast that walks you through the process. We’re diving into the Expert mode in Photoshop Elements 15 here, so this process is a little more complicated than the Guided Edits I’ve walked you through before. If you’re a beginner with Photoshop Elements, try watching just one step of the video at a time. Watch me do something, then hit pause and open up Photoshop Elements and repeat the step on your own. Then go back to the video for the next step. It will make sense as you do each step yourself! Cool, right? 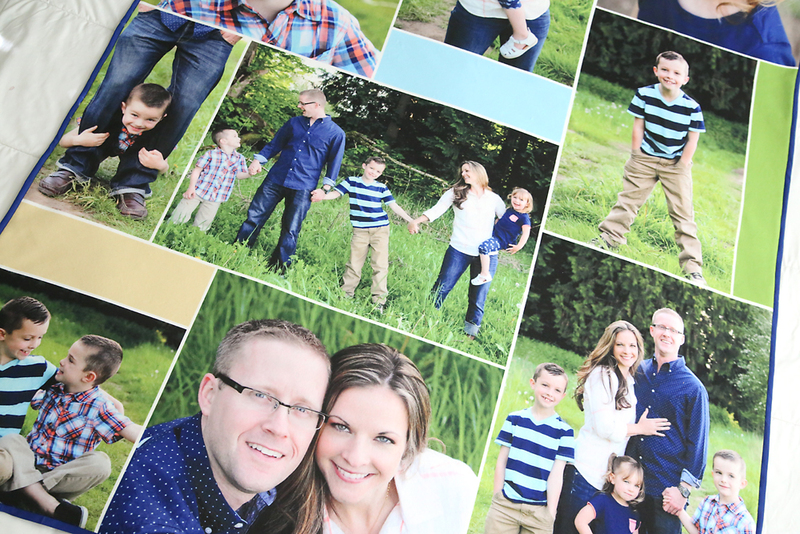 Making photo collages is a fun process to play around with, and printed collages make gorgeous gifts. 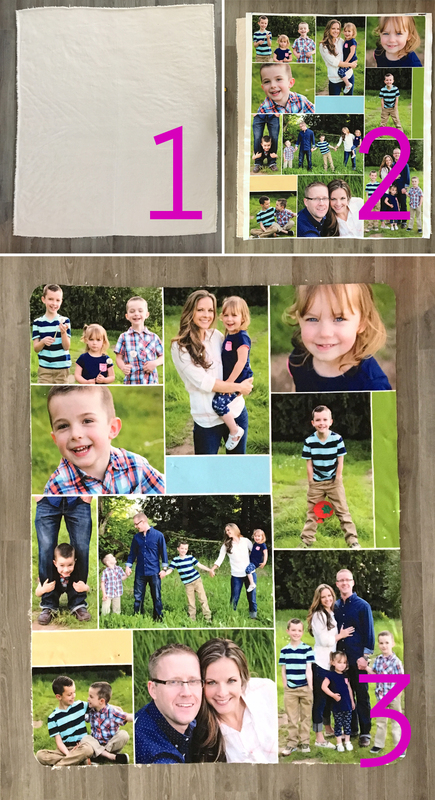 Here’s another screencast to give you step-by-step information on the collage I made for my photo blanket. 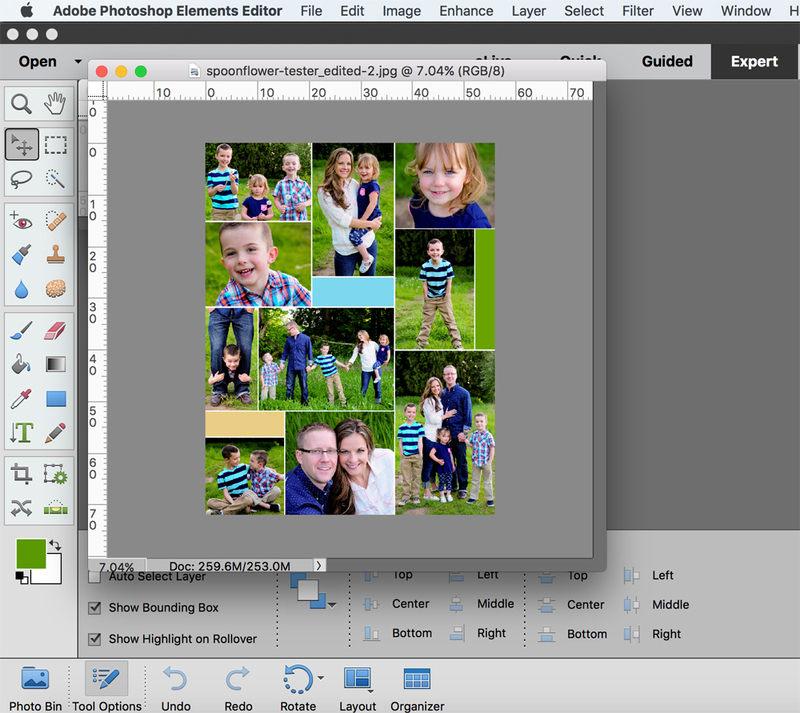 Once you’ve created a photo collage in Photoshop Elements 15, making that collage into a blanket is pretty simple. Visit Spoonflower.com and upload your collage. Choose fleece as your fabric choice, and 2 yards as the fabric size (if you made your collage 56 in wide and 72 in long like I did, it will fit perfectly). Order the fabric. When your fabric arrives, you’ll be so excited! (You can see how it will look in photo 2 below). To make a no-sew blanket, you can simply trim around the edges and use the fabric as is. 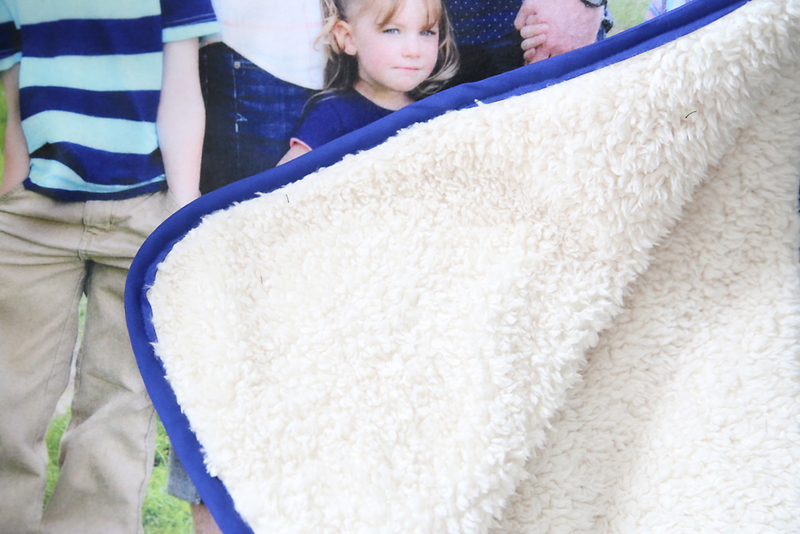 The fleece is very soft and pretty and you’ll have a light weight throw blanket. 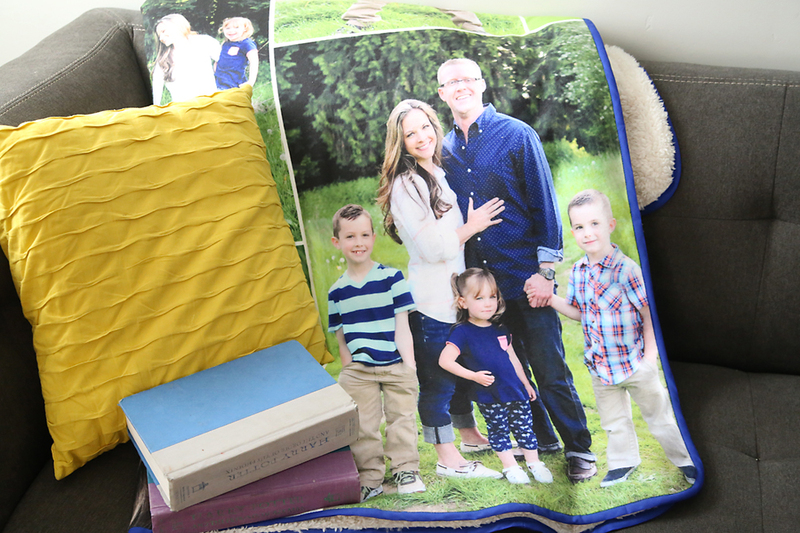 Or you can back the blanket with a fuzzy fabric for a heavier, snugglier photo blanket. To add a backing, purchase 2 yards of 60 inch wide fabric – I used Sherpa. Lay the backing fabric out on a hard surface, right side down, and smooth out any wrinkles (photo 1). Then lay the photo fabric on top of the backing, right side up, again smoothing it out really well (photo 2). 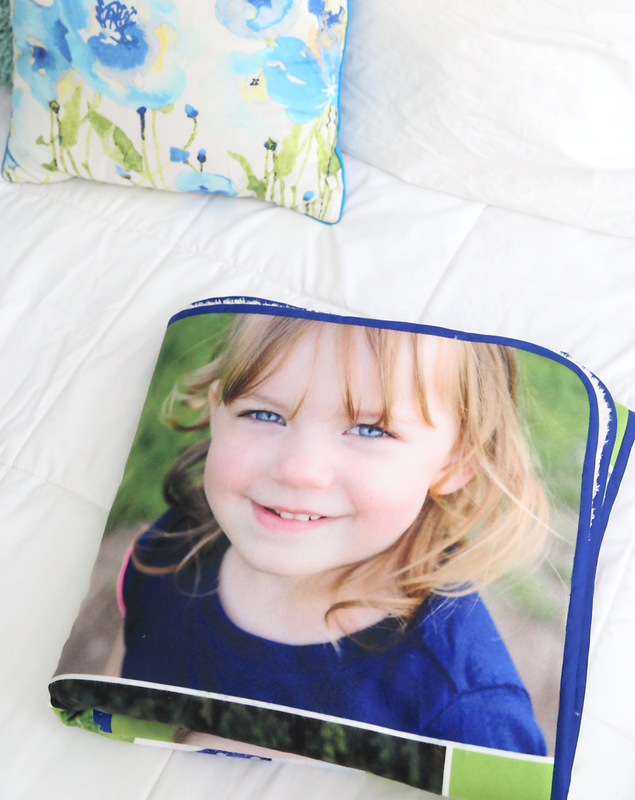 Pin the photo fabric to the backing fabric all over the blanket. Then trim all the way around the edges, rounding corners if desired (photo 3 above). Then use bias tape to bind the edges, all the way around. It took 3 packages of extra wide double fold bias tape. And check out the snuggly sherpa on the underside! NOTE: If you’d like the blanket to look more like a quilt, you could sew the two layers to each other along all the margins in between each photo before binding the edges. 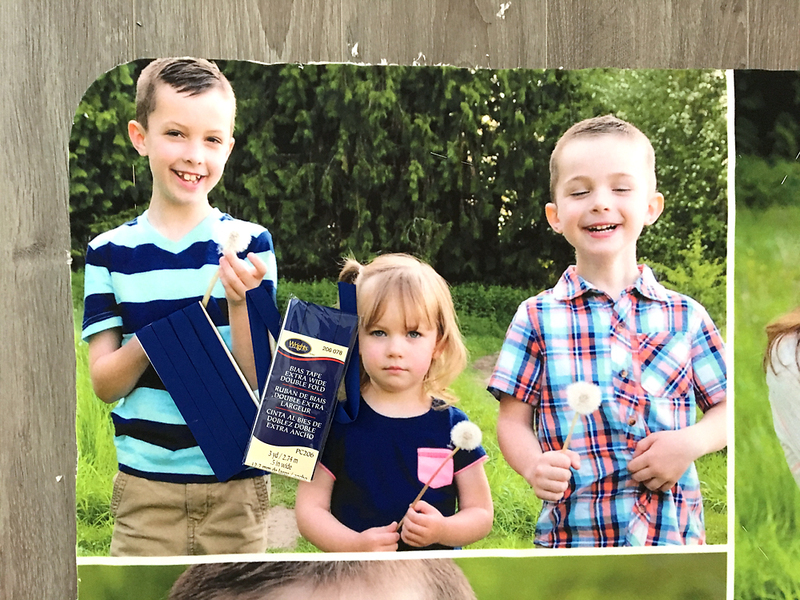 Or you could tie it together with yarn at the corner of each photo. I really hope my sister loves it! Thanks for visiting, guys. Check back for more gift ideas, sewing projects, and Photoshop Elements 15 tutorials – plus another Photoshop Elements 15 giveaway in a few weeks! Thank you to Adobe for sponsoring this post. This is so cute! I really wish I had seen it a week ago since I just ordered like $100 in supplies to make my husband a photo quilt, and this would have been SO much easier for probably less money! What a splendid post. Thank you. I’d like to make one for my granddaughter but she often sleeps with her dog on the bed 🙁 Is the photo quilt machine washable? It’s beautiful your sister will love it. Looking at the photos I’m still bit confused as to how to made to two parts stay together. The tape used was just to hold the edges together but you didn’t keep the tape on there. How did the image stay on the blanket? Seems like I’m missing a step. Did you use some kind of fabric glue before trimming the edges?